ImuPro Screen is a semi-quantitative IgG antibody test providing an individual analysis of 22 foods using a capillary blood sample. It is a simple way to find out quickly and at a reasonable price whether any IgG antibodies are detected against foods. 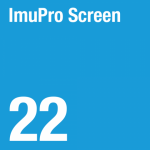 Click here to download an example of an ImuPro Screen report. ImuPro Screen categorizes foods tested into two groups – reactive (elevated) and non reactive (not elevated) and does not include dietary recommendations thus this test will need to be ordered through your health practitioner in order for him/her to assist you with dietary and other management after receiving your results (if you do not have a referring practitioner, you can find one from the list of Health Practitioners Associated with WellPro). 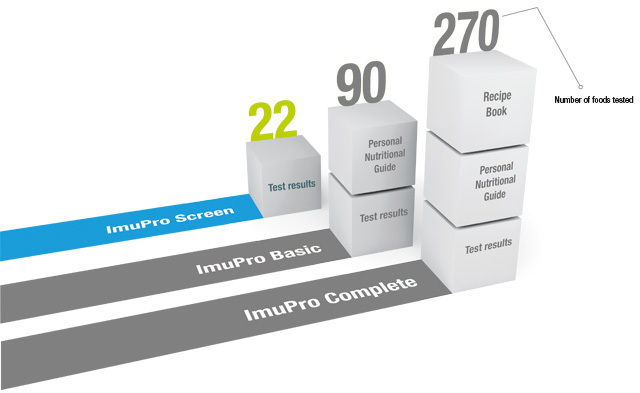 If results from the ImuPro Screen show that there are elevated levels of IgG antibodies against certain foods, your health practitioner may wish to carry out the complex individual testing of 90 food allergens using ImuPro Basic or 270 food allergens using ImuPro Complete. An individual is unable to upgrade to other ImuPro tests using their capillary blood sample, a blood (serum) sample would be required to be drawn. Some differences between the capillary and serum results could occur, due to the variable blood spot volume, cut-off values and time between sampling. *Please note: ImuPro Screen results will not be sent to clients directly (ISO15189:2012: 5.9.1 Release of results). Clients will receive their results from the health practitioner after discussing their results with him/her.